Cape Fox skull. Vulpes chama. 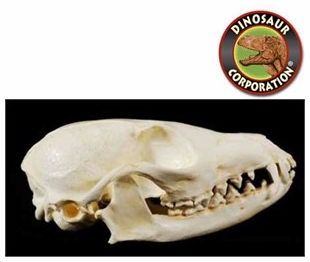 Cape Fox skull replica is cast from original specimen. Polyurethane cast of an original California Academy of Sciences specimen. Vulpes chama;A lightly built,slender fox,with bushy tail,medium to large ears and a finetapered muzzle. HABITAT;Open Acacia grasslands,steppe, subdesert scrub and open grassy areas within bushland. The Cape Fox (Vulpes chama), also called the Cama Fox or the Silver-backed Fox, is a small fox. It has black or silver gray fur with flanks and underside in light yellow. The tip of its tail is always black. The Cape Fox tend to be 45 to 61 cm long, not including a 30 to 40 cm tail. It is 28 to 33 cm tall at the shoulder, and usually weighs from 3.6 to 5 kg.